We’ll kick this gallery off with a video. If we want to go further than the moon then we’re going to have to figure out where we are going, it is pointless planning a route with your eyes closed and the James Webb Space Telescope is designed to give us a greater understanding of the universe. 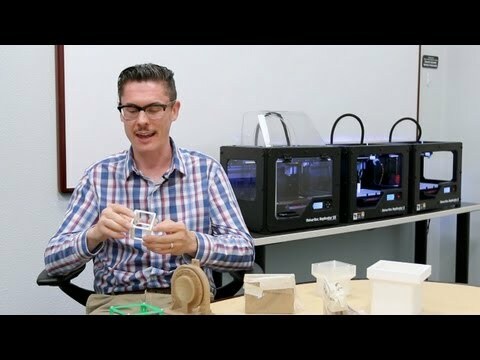 Mechanical Engineers at Lockheed Martin - the industrial partner to the NASA project – are using MakerBot Replicators for rapid prototyping purposes. They say that the machines are helping them work in parallel to the testing processes by NASA, massively speeding up and therefore cutting costs of the design. This is hugely important in keeping the project on track, it has been on shaky ground after coming under scrutiny from US Congress for overspending. In order to get into space you need power and lots of it. Current rockets are hugely expensive and take considerable time and tooling to create. 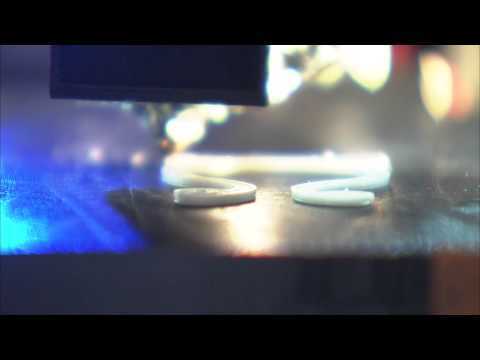 NASA are using additive manufacturing to test parts that they say could be up to 70% cheaper to reproduce. The pictured rocket-firing test recently showed the 3D printed part coping with 20,000lb of thrust. Traditionally a similar part would be made up from around 115 components, due to the ability to create complex structures with 3D printing this part is made from just two components! If the rocket holds up in scrutiny tests then we could see this cheaper rocket go into full production, which could see us all on flights to space one day. The problem with working in zero gravity is you can’t put things down, say you needed to fix the satellite dish on the side of your house, you can just put that spanner down and be sure in the knowledge it’ll stay put. In space DIY ain’t so easy, spanners float off and not all parts are readily available, you can’t just nip to a local hardware store for that hinge that’s broke on the kitchen door, that's the air-lock door and you're going to die without it. This is were 3D printing comes in, NASA have been testing printers in zero-gravity conditions and have now announced that they are planning to use the a printer on-board in 2014. "Rather than hoping that the necessary parts and tools are on the station already, what if the parts could be 3D printed when they needed them?" We’ve all seen space food right? They come in sachets like cat food, which are warmed in a microwave. Space food has to be packaged neatly and rich in nutrition, whereas Meal, Ready to Eat (MREs) used by the armed forces are designed to keep very active soldiers in battle, the meals designed for astronauts must cater for a slower, older clientele. NASA have steadily improved the available food list but essentially the preparation and packaging of the products have stayed the same since the early days of Neil and Buzz. This year NASA granted $125k to Systems and Materials Research Corporation (SMRC) to see if they could develop more appetising food for astronauts to eat should they endure a fiver year trip to Mars. 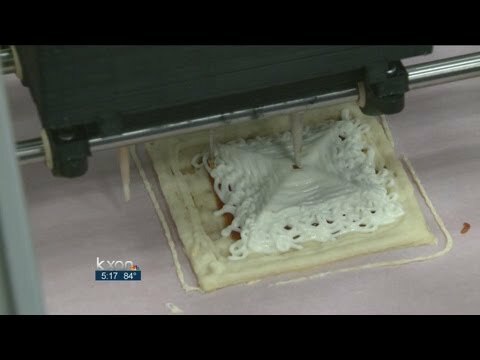 The first display of this was a 3D printed pizza, made from food powders, layered down in essentially the same way as an FDM machine. I wouldn’t have thought it is going to get the Associazione Vera Pizza Napoletana seal of approval but it may be slightly tastier than those packets of Whiskers astronauts have previously had to endure. So you’ve landed on the moon, ready to start your new life. But where are you going to live? There are no trees to build a tree house, no corrugated iron (unless you take apart your ship) for your roof, I don’t imagine you had the funds to bring bricks out with you so where the heck are you going to live? Well what if we could send giant 3D printing robot spiders to the moon before you and those spiders could make a habitat for you to live in out of moon dust? Ridiculous you might think, but, according to the SinterHab's recent study, theoretically perfectly possible. The Renaissance astronomer Johannes Kepler dedicated his life to understanding space and in particular the moon. He spent the last decade of his being writing the work of fiction, Somnium, released in 1634, four years after his death. The novel details explicitly how the earth would look from the moon and the book is considered by many to be the first true work of science fiction. 379 years later and we’re still obsessed by space travel and exploration. Since the end of the Apollo era things may have appeared to slow down a little but that couldn’t be further from the truth and it is 3D printing that is proving to be the catalyst for a new space craze. 3D printing now plays a crucial part in the research and development of all things astronomical, in the gallery above we explore the five ways the technology could be the final piece in the jigsaw to send us into the final frontier.